It’s almost time for PAX West 2018! If you’re in town for the convention, here’s everything you need to know to ride the griffon, watch a live Guild Wars 2 art demonstration, and attend our community event. We’ll also be covering the convention fun on our social media channels. During convention hours, you can find us in the Washington State Convention Center at booth 1102 on level 4. Come say hi, ride Bessie the griffon, and brave the Deepstone fractal at our gameplay stations. Bring along a full party of real-life companions if you’d like to take on a fractal challenge! If your friends don’t believe in griffons, prove you really met one by sharing a picture of your griffon ride on Twitter or Instagram. Tag your post with #GW2IRL and #GW2GiveAway for a chance to win one of 50 Amazon gift cards. Looking for Guild Wars 2 merchandise? Visit For Fans By Fans at booth 7411 for apparel and more, and pick up the Guild Wars 2: Path of Fire™ 2xLP vinyl soundtrack from iam8bit at the Indie Megabooth. Watch Art Director Aaron Coberly create an oil painting based on Seattle Cosplay’s beautiful work. The live painting session will take place from 10:00 a.m. to 11:00 a.m. Pacific Time (UTC-7) in the Hydra Theater. If you can’t attend in person, you can watch the session live on the official Guild Wars 2 Twitch channel. 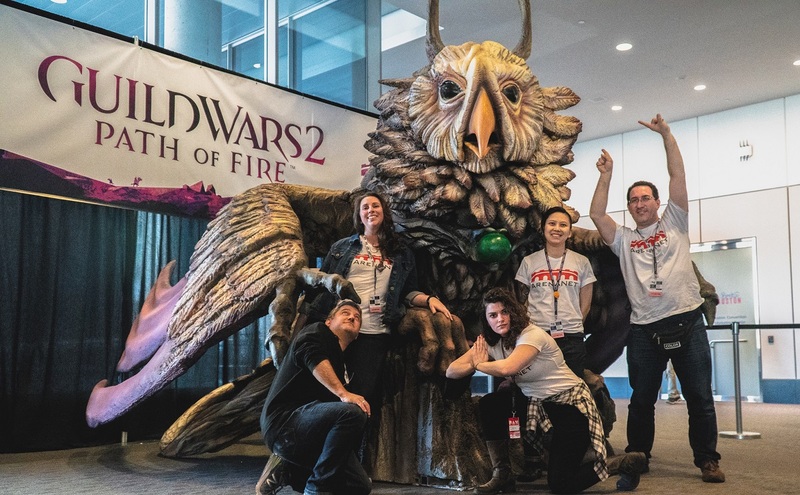 Party with ArenaNet developers and fellow fans at our community event on Sunday, September 2. The event will begin at 7:00 p.m. Pacific Time (UTC-7) at Gordon Biersch in Seattle. We’ll provide light refreshments and two drink tickets per attendee. You don’t need a PAX badge to attend, but space is limited. Sign up here if you know you’ll be able to attend. Head over to Twitter and the forums for more opportunities to grab tickets. Starting at 6:00 p.m. Pacific Time (UTC-7), we’ll be streaming live from the event to talk to developers and fans. Tune in to watch on the official Guild Wars 2 Twitch channel! Shield of the Goddess Is Now Available in the Gem Store!